Can anyone confirm the correct paint / colour code or the name (Lime Green?) 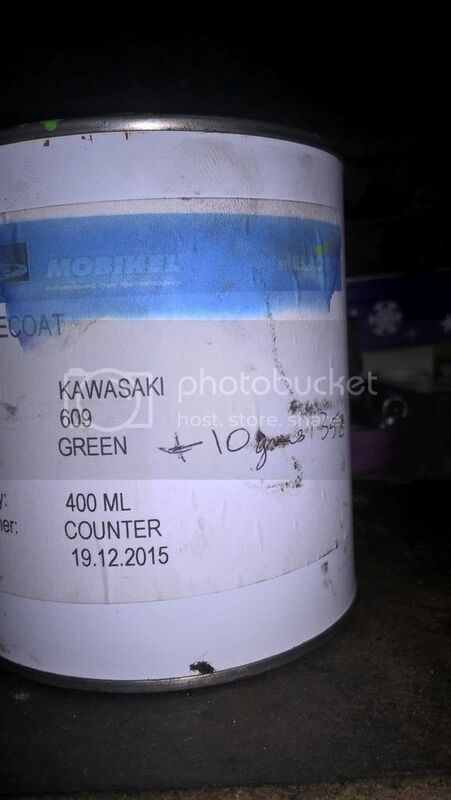 for the NON METALLIC Green paint on a 2006 ZRX1200R A6F ? There seems to be a few shades of the non metallic green so not sure which is which ? Think I may have found it..................Lime Green 777 ??? This is the code on the paint mine was repainted in, supposed to be the same green as on the late model bikes with the black and white stripes don't know if it helps. Think I may have found it..................Common As Dogshite Green 777 ??? Off the Cornwall Kawasaki website. LIVE EVERY DAY AS THO ITS YOUR LAST CAUSE ONE DAY YOUR SURE TO BE RIGHT!!! The netallic is candy lime green, thats the one yer don't want. It says my 2001 is called Pearl Jade Green - so there are a few variations. My painter can do the one on my bike ok if anyone needs it. 1100r's were pearl jade , 1200r's were deffo only candy lime green if metallic. Got my touch in paint today via Ebay and its a perfect match ! Any chance you can please let me have the contact details of your Painter.. I've bought a used 1984 KZ1000R fuel tank from the US of A and it needs a complete respray. I seem to remember you had a pukka paint job done to your ZRX when you was restoring it a few years ago.